Today, June 29, the United States Mint released rolls and bags of the America the Beautiful Quarter honoring Blue Ridge Parkway in North Carolina. This quarter is the third in 2015 and the 28th overall, signaling the completion of the first half of the fifty-six quarter series. Officially introduced last Thursday, these coins actually started entering circulation earlier in the month. 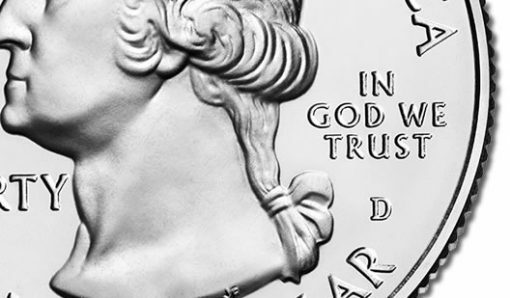 Still, many collectors will buy them straight from the U.S. Mint since finding quarters of a certain design and by unique mint mark can take many months to years. Plus, those from the San Francisco Mint are made only for coin collectors so none of them will enter circulation. 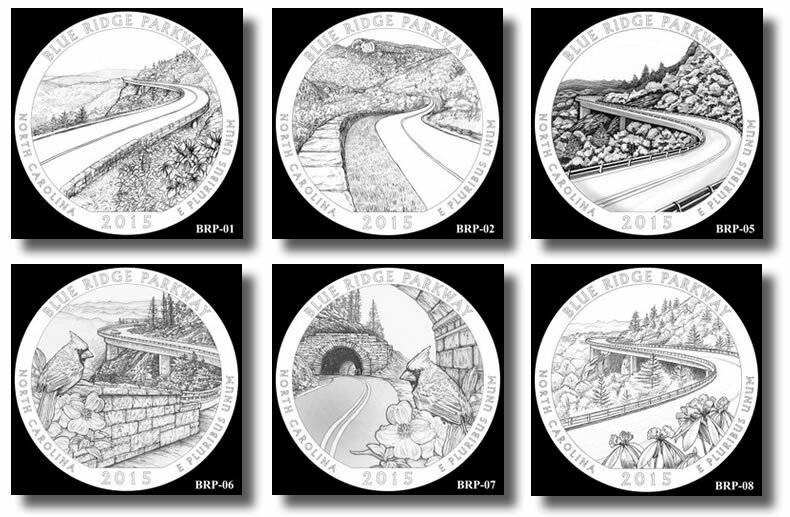 Before the image for the Blue Ridge Parkway quarter was selected, a total of 6 candidate designs went under review. All of them offered a depiction of the roadway and the scenic beauty seen from it. Designed by Frank Morris and the sculpted by Joseph Menna, the quarter’s reverse depicts a curved road hugging the side of a mountain as it enters a tunnel. North Carolina’s state flower, the Cornus florida, also appears in the coin’s foreground. Inscriptions around the scene include BLUE RIDGE PARKWAY, NORTH CAROLINA, 2015, and E PLURIBUS UNUM. The quarter shows a winding road that hugs the side of a mountain as it leads up to a tunnel. North Carolina’s state flower is also prominently featured. Common among all America the Beautiful quarters, the obverse or heads side shows John Flanagan’s portrait of George Washington. Surrounding inscriptions read: UNITED STATES OF AMERICA, LIBERTY, IN GOD WE TRUST and QUARTER DOLLAR. Mint marks appear on quarter obverses, indicating where they were made. Here you can see the ‘D’ mint mark for the Denver Mint. Obverses also have a mint mark of ‘P’, ‘D’ or ‘S’ to notate their striking in Philadelphia, Denver or San Francisco. The quarters that are struck in Philadelphia and Denver will eventually make their way into people’s pockets as they are released into circulation, but this is not the case for the quarters minted in San Francisco as they are only produced for and sold to collectors. The above products are available from the United States Mint’s website at www.usmint.gov. Here’s a link to the Mint’s quarter products. Use 1-800- USA-MINT (872-6468) for phone orders. The U.S. Mint released the first quarter from its America the Beautiful Quarters® Program in 2010 and has issued five quarters every year since then. Quarters previously released this year include those commemorating Homestead National Monument of America in Nebraska and Kisatchie National Forest in Louisiana. There are two more to come in 2015, and they will honor Bombay Hook National Wildlife Refuge in Delaware and Saratoga National Historic Park in New York. Look here for quarter news about past releases. The program is scheduled to wrap up in 2021 after a quarter has been released to honor a national site in all 50 states, D.C. and the five territories of the United States. I have a coin like that also, the Blue Ridge Parkway quarter. I would describe as a part of the foliage of the coin. What do you think? 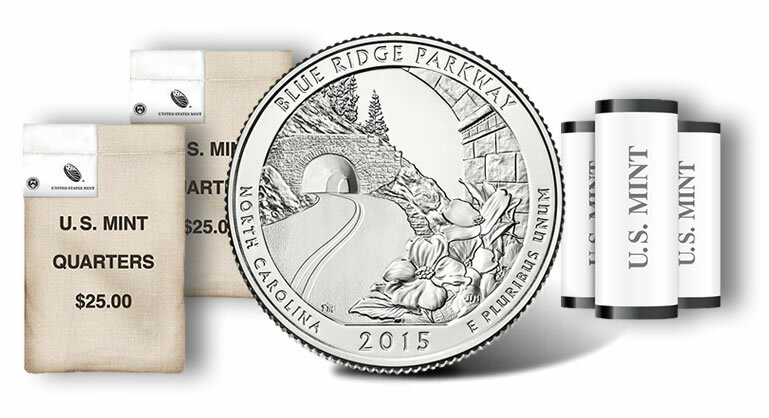 I recently traded in a 10$ bill for a roll of quarters… It is a roll of the Blue Ridge Parkway (P) coins. A few have doubled “UNUM.” It is slight but it is there… I’m taking pictures tonight. Could these be worth anything? I have a quarter with no mint stamp on it. Is this worth something besides a quarter? I have 3 blue ridge parkway quarters on the p 2015 the 5 is different i have 2 p 1 d and the other ones the 5 is the same! I found a cameo style Blue Ridge quarter in my possession today randomly…what is the value? Has an S printed on it as well. It is circulated, lightly, so I know it will affect the value, just curious. I have a quarter from 2015 from the American the beautifully program. The side is smooth, it is thicker than the other quarters I have in the same series. Plus the back where the cabin is also smooth. The thickness answer smooth side looks like an error but not sure about the back. The outline of the cabin is noticeable but no detail. 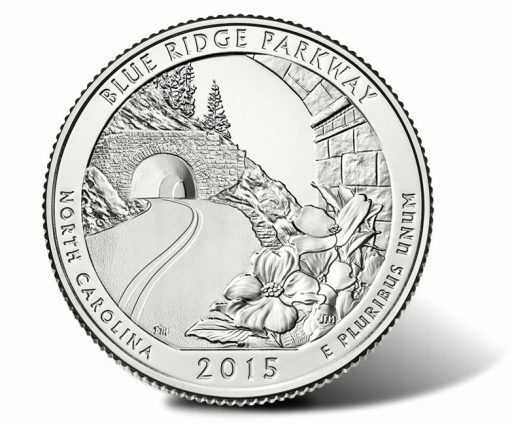 I have a near uncirculated 2015-s Blue Ridge Pkwy quarter. What’s it worth? I have a 2015-D Blue Ridge Pkwy quarter that has a concentric [.003 – .005 thickness] ring on the face side. It starts inside the neck base on the left side, passes through ‘Liberty’, through the top 1/16” of head [hair line], through ‘In Gog We Trust’ and lastly. through end of pig tail at bottom of the wig. Any idea as to how many of this so marked quarter made it into circulation?